If the JD-Xi's mini keys aren't to your liking, maybe you'll prefer the full size ones on the JD-XA. Find out more in the press release below or on the Roland website. We'll bring you price and availability details when we have them. 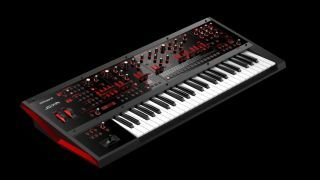 Roland is pleased to announce the JD-XA Analog/Digital Crossover Synthesizer, an advanced new keyboard that offers a unique and powerful approach to synthesis. Equipped with fully featured analog and digital sound engines that can be used independently or interactively, the JD-XA brings together analog warmth and digital versatility in one super-creative, no-compromise instrument. The JD-XA's analog side features a discrete, four-part engine with true analog filters and a direct dry output. Each part has two oscillators, along with filter and amp sections and four envelopes with incredibly fast attack and response times. There are also two LFOs with super-smooth coverage from ultra-slow to ultra-fast. After building an analog sound, users can route it directly to the dry output, or send it to the onboard digital effects to shape the sound further. On the digital side, the JD-XA is equipped with a four-part, 64-voice sound engine powered by Roland's acclaimed SuperNATURAL synthesizer technology, providing some of the most expressive and natural sounds available anywhere. The engine is compatible with the synth engine from the INTEGRA-7 sound module, a favorite of top producers, composers, and sound designers. This allows users to take advantage of the large library of custom INTEGRA-7 sounds available for free at Roland's Axial website. With its comprehensive 16-track pattern sequencer, users can build songs and beats directly inside the JD-XA. There are 8 tracks for internal parts and 8 tracks for external sources, plus real-time and step recording modes for capturing parts in the method that best suits the user's style and music. Friendly and intuitive, the JD-XA's interface is built around harnessing the potential of its remarkable sound engines. The velocity-sensitive keyboard supports aftertouch, and there are plenty of backlit sliders, knobs, and wheel controllers for direct hands-on control while creating and performing. JD-XA owners can add an extra dimension to their sound via the synth's built-in mic input. A voice can be used as additional modulation source, controlling filter cutoff, Cross Mod, or other parameters for unique effects. With the Vocoder, users are able to sing into the mic and control the tone and pitch via sounds played on the keyboard. The mic input can be used for normal singing as well, with a high-quality reverb available as a dedicated vocal effect. Along with standard MIDI I/O, the JD-XA features a USB audio/MIDI interface for working seamlessly with computer music software. It's also equipped with two CV/GATE outputs, making it easy to interface with popular CV/GATE instruments.